It happened at the Sainsbury's Local store in Billingshurst in the early hours of Friday morning. The ATM was pulled from the wall, leaving debris across the High Street. 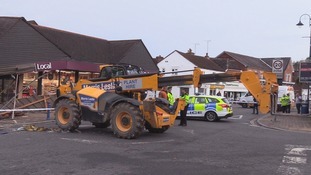 A month ago a forklift truck was used in a similar ram raid in the nearby village of Rudgwick. Sussex Police want to hear from anyone who witnessed the raid. Sainsbury's has apologised to customers for the inconvenience caused and say it's doing all it can to re-open the supermarket as soon as possible.